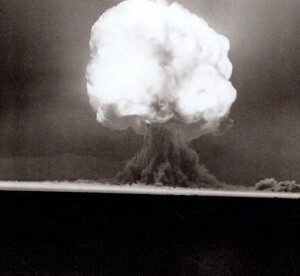 The birth of the Atomic Age took place precisely at 5:29 a.m., July 16, 1945, on a remote 18 mile by 24 mile portion of the Alamogordo Bombing and Gunnery Range northwest of then-Alamogordo Army Air Field, N.M.
With a group of more than 500 military personnel and civilian scientists, Dr. J. Robert Oppenheimer, director of Los Alamos Laboratory and designer of the atomic bomb, culminated three years of planning, development, and secrecy by some of the most talented and brilliant minds in the United States. Included in those numbers were numerous German refugees, who were noted scientists in the field of physics. From 1945 to 1962, the U.S. conducted over 200 atomic bomb tests. These tests took place at several locations such as the middle of the Pacific Ocean, the Aleutian Islands, and the Nevada Test and Training Range. All these tests were filmed and documented for scientists to analyze. Unfortunately, the film used to collect these images is deteriorating and faces the possibility of being lost forever. Scientists at the laboratory worked to rescue these films from decomposing in vaults around the country. With a team of film experts, archivists and software developers looking through high security vaults, scanning, digitizing, and declassifying the films, the restoration process has taken over five years. The laboratory’s goals were to preserve the films’ content before it’s lost forever. The team now hopes to provide better data to scientists who are discovering the previous estimates of the amount of energy released in the early tests could be off by as much as 30 percent. Team leader Greg Spriggs, LLNL weapon physicist, said the restoration project could take another two years to scan the rest of the films with additional years to conduct more analysis and declassify the remaining 10,000-plus films. However, for the men and women who had been working on “the bomb” since 1939, the need to test the first atomic bomb was critical. The belief in the U.S. was the Nazis were two years ahead of them, having begun working on an atomic weapon since accidentally discovering nuclear fission in 1938. “The Manhattan Project was built on fear — fear that the enemy had the bomb or would have it before we could develop it,” said Robert Furman, an assistant to Maj. Gen. Leslie Groves, who served as the military leader of the Manhattan Project. The selection of the test site was based on several criteria including availability, distance from Los Alamos — where Oppenheimer and his team worked — good weather and no settlements. 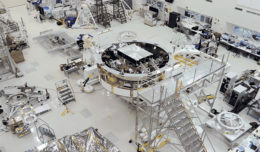 The site was pared down from a list of eight possible test sites including the Tularosa Basin near Alamogordo and an area southwest of Cuba, N.M. Additional sites considered were an Army training area in California near the Mojave Desert; an island off the coast of Southern California, and Padre Island, Texas, in the Gulf of Mexico. Editor’s note: Part two of the series will focus on the build-up of the site where the bomb was tested.